Nyurapayia Nampitjinpa, also known as Mrs. Bennett, was born around 1935 in Yumara, Western Australia. Later Mrs. Bennett moved to Kintore. She was married to the late John John Tjapangati, a Pintupi speaker from Mukulurru, also north of the Docker River. Mrs. Bennett started painting in the mid 1990s. 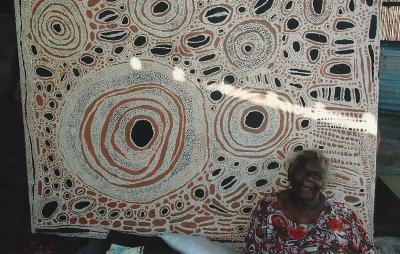 Together with Naata Nungurrayi she was an important participant in a collaboration pr . . .